philosophy's take a deep breath SPF30 sunscreen/day cream is an oil-free oxygenating gel-cream. With this cream, you can breathe new life into tired, stressed skin. Over time, oxygen levels in your skin decrease, leaving skin looking dull and dry, making you look older faster. philosophy skin labs have developed a lightweight oil-free SPF30 moisturizer with exclusive clean-air technology to keep skin looking and feeling hydrated, energized, radiant and protected from the sun so it can breathe freely to help resist aging and recover from the perils of everyday life. To use, apply to clean face in the morning after cleansing skin. Make sure to wear at least a SPF30 daily to combat the sun's UVA and UVB rays. This sunscreen contains avobenzone 2.7%, octinoxate 6.74% and octocrylene 2%. These are all chemical sunscreens. If you are allergic to chemical sunscreens this product would not work for you. However, I have tested it and it is great and works very well. It is a broad spectrum SPF, meaning it covers both the UVA/UVB spectrum. For sunscreens, this one is very nice. Why? Because it is light and airy and sinks into the skin when applied. Most sunscreens sit on top of the skin and don't really sink into the skin. They just kind of sit on top of the skin feeling greasy. take a deep breath SPF30 does not do that. It is a gel-cream, so it sinks into the skin, making the skin feel petal soft and skin is then protected from the sun and also has anti-aging properties too. (**4-week self assessment study, 44 women, ages 20-35). After using this, I wake up with the softest, plumpest skin I have ever had. My skin changes overnight with this mask. It is like a super plumping gel-cream that is available for the skin. I absolutely love this. Sleeping masks are all the rage right now as well they should be. At night our skin regenerates itself. That is why all the good skincare is reserved for nightly use. Once a week substitute this from your regular routine and you will not be sorry. You will have plump, radiant skin just like mine. 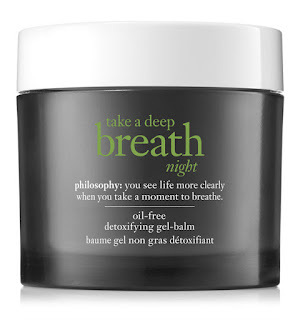 philosophy take a deep breath SPF30 retails for $37.00 and take a deep breath night is $45.00. Both can be found online at www.philosophy.com, www.sephora.com, www.ulta.com, www.beauty.com and www.skinstore.com. It can also be found at many other places where they sell philosophy products. Like philosophy on Facebook: https://www.facebook.com/philosophy; Follow philosophy on Twitter: @lovephilosophy; Follow philosophy on Pinterest: https://www.pinterest.com/lovephilosophy/; Follow philosophy on Instagram:https://www.instagram.com/lovephilosophy/ and Subscribe to philosophy on YouTube:https://www.youtube.com/philosophy.